New NPR CEO Gary Knell Starts Work, Takes Listeners' Calls : The Two-Way He fills the positions that opened earlier this year when controversies led to Vivian Schiller's departure. Today on Talk of the Nation, and later on Twitter, Knell takes questions. -- He was on Talk of the Nation this afternoon, and took questions from callers. We hit some of the highlights in updates below, and we're embedding a copy of the audio in this post. Update at 2:30 p.m. ET: On the controversies that cost his predecessor her job (see below for a recap on them), Gary said he "can't really comment on those. ... I wasn't here and don't really know the facts." And, he added, "it's time for NPR to turn the page and move forward." NPR CEO and President Gary Knell. Update at 2:15 p.m. ET: He'll work to make sure NPR is on a "sustainable economic plan," Gary just told Talk of the Nation host Neal Conan, and he sees federal funding as "an important leg of that stool." He likened public broadcasting to museums, libraries and other organizations that get government support because they're "important to our culture." But, he added, "I'm not going to count on anything," including continued federal funding, and won't "take anything for granted." Update at 2:05 p.m. ET: The show's begun. There's an audio link at the top of this post now. Just click on "LISTEN: Gary Knell on Talk of the Nation." -- There's a post written by Gary on the This Is NPR blog. "This organization has a profound impact on our world every single day," he writes. "I'm humbled to now be able to say 'we' when I talk about all that NPR has done and will continue to do. ... The media environment is increasingly crowded, chaotic and complex. What people need is not just more information, but an ally to help them make sense of it all." -- At 3 p.m. ET, Gary's due to have a "tweet chat." 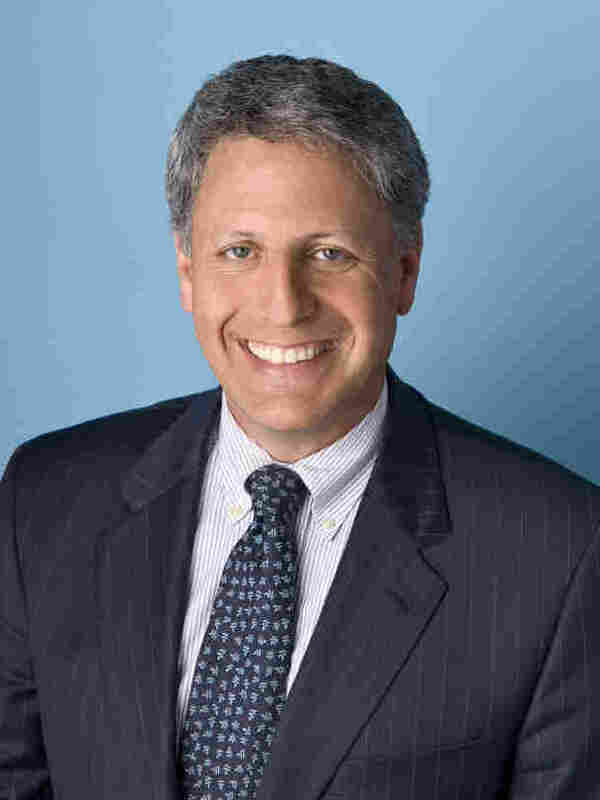 He's @nprgaryknell, and questions can be tagged #nprceo. Vivian Schiller resigned as CEO and president last March after two high-profile controversies led the board of directors to conclude that she could no longer effectively lead NPR. There was the Fall 2010 dismissal of NPR analyst Juan Williams after he said on Fox News Channel that he gets nervous when he sees people in "Muslim garb" on airplanes. Williams went on to say it's wrong to profile or stereotype anyone based on his or her appearance, but NPR said it was one of a series of comments he had made that violated the network's standards. The handling of his dismissal and the controversy surrounding it — including comments Schiller made about Williams that she later apologized for — made headlines for several weeks. That controversy also led to the resignation of NPR's top news executive at the time, Ellen Weiss. Her permanent replacement has yet to be named. And there was the release last March of a videotape surreptitiously made by associates of conservative activist James O'Keefe and heavily edited before its release, showing then-NPR fundraiser Ron Schiller (no relation to Vivian) slamming conservatives and appearing to question whether NPR needs federal funding. NPR General Counsel and Senior Vice President for legal affairs Joyce Slocum served as interim CEO until today. Gary joins NPR from Sesame Workshop — producers of the Sesame Street educational children's TV show — where he was president and CEO.